Active from 1942 to 1970, the Christian Friends for Racial Equality (CFRE) was a locally founded leader in the Seattle civil rights movement. CFRE’s non-confrontational social methods for improving race relations made it Seattle’s largest civil rights organization in 1956, with 1,000 members by 1959. CFRE’s social activities included monthly meetings with guest speakers, social teas and luncheons, folk dancing, and picnics. 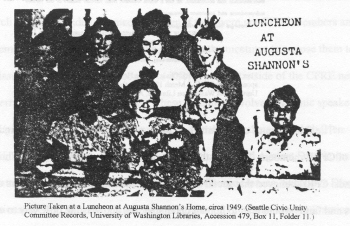 The Christian Friends’ more businesslike work included maintaining an office, publishing a monthly newsletter of civil rights news and membership updates, coordinating with other local civil rights groups (like the NAACP and the Seattle Urban League), contacting businesses and the government to encourage equity, running a speakers’ bureau, and working through churches and synagogues to promote racial equality. CFRE was especially active in the 1940s and 1950s with desegregating cemeteries, the “open housing” movement, and spurring government action to improve equality, all at the municipal and county levels. Despite its name, CFRE was an ecumenical group that also included many Jewish members. Two-thirds of its membership and officers were women. CFRE members tended to be of middle age and older and were involved in other civil rights groups. Given its non-confrontational, social approach, and its membership, it is not surprising that as the national civil rights movement evolved towards direct action and legal battles, and became increasingly driven by young people, that CFRE found difficulty attracting members and affecting change. Its last known records date from 1970; by that time, the group had slowly dwindled to obscurity. Johanna McClees [Phillips], "Christian Friends for Racial Equality: A Unique Approach to Race and Religious Relations in Seattle 1942-1970," (B.A. Thesis, University of Washington, 2000), UW Manuscripts, University Archives and Special Collections, University of Washington Library, Seattle, Washington; David Wilma, “Christian Friends for Racial Equality,” HistoryLink, 2001, History Link, 14 July 2005, http://www.historylink.org/essays/output.cfm?file_id=3164 .